By Western Electric Co. Inc. Deep chocolate coloured loom (CO-287) with an American version of the standard RAF bell jackplug to one end (PL-179) and a Type T-44-A magnetic microphone and AAF JK-26 socket at the other. The T-44 fitted inside the nose section of AAF masks alleviating the need for a throatmicrophone. Used primarily in aircraft fitted with RAF radio equipment, this loom enabled AAF crews with the 8th and 9th AAF to plug their American made headgear into RAF aircraft. The standard AAF helmet jackplug connecting to the JK-26 and the bellplug to the aircraft. This is really quite a rare find. Superb unissued condition with original box having a 1943 contract date. 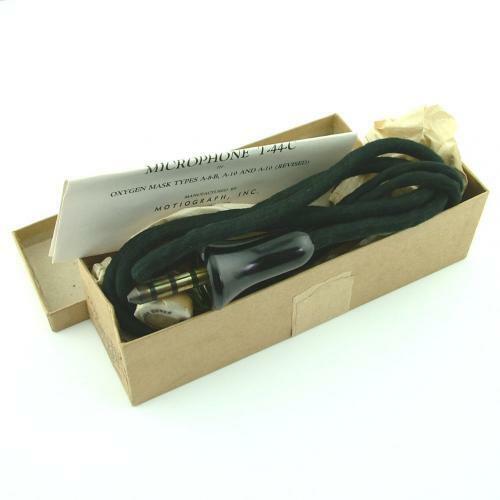 Comes with the original instructions for installation in A-9 & A-10 oxygen masks. Stock code H21240.